Whether covering political conflict or natural disasters, there is a tendency to feature photographs that express the dramatic scale of the event. Pictures of burning vehicles or of a throng of victims overwhelming an aid station–such images seem to be made for the big screen. They announce that you are seeing News about History in the Making. Sometimes, however, the devil is in the details. This photo of riot police in Thailand is almost too close to make sense. Any clear sense of the larger scene lies outside the frame, and our attention is drawn away from the action to focus on the costuming. And they are costumed. If nothing else, the neck guards allude to Samurai movies while the face mask adds a classic Ninja accessory, and these guys could be stepping right out of Studio B. There are fashions in police wear just like anything else, not to mention cultural and national traditions to be donned on behalf of an appearance of authority. But that’s actually the least of what is being revealed here. 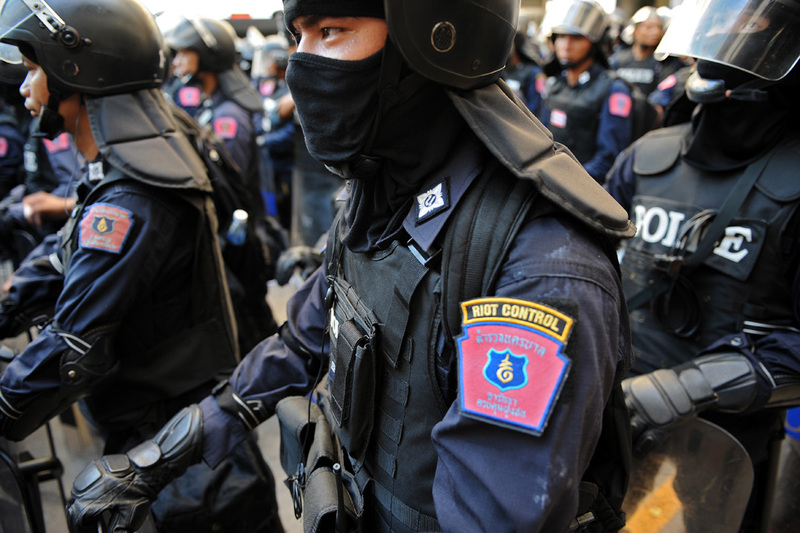 Note the use of English in the police badge: “Riot Control” speaks loudest, and only then the text in Thai below that. Likewise on the front of the protective vest in the background: “Police.” Nor is this limited to Thailand: I’ve been able to read “Police” on uniforms, cars, shields, barriers, and cordon tape from dozens of countries around the globe. The enhanced legibility is to be appreciated, but I also wonder why the police are so likely to be identified in English. Perhaps this habit of identification is entirely pragmatic. English is an international language, there are many English speaking tourists and other travelers, double coding uses available space to reduce misunderstanding, state legitimacy requires legibility, and it can’t hurt to accommodate US media. But uniformed police are easily recognized anywhere without the label, and why is the Anglophone reader being told that these police are riot police? Are we to believe that they don’t exist otherwise, or that they could only be responding to violence instead of instigating it, or that the event in question is a riot and not, for example, a demonstration of political dissent? And why tell that to the US or UK or Australian media audiences, and not, say, China? The use of the English “police” is clearly political on several levels. I’ve learned that it is not easy to quickly find the extent of US funding of the Thai police force or of any other police force. I did learn, however, that despite “legislation prohibiting US agencies from using foreign economic or military assistance funds to aid foreign police,” Congress also granted so many exemptions that the “GAO did identify 125 countries that received U.S. training and assistance for their police forces during fiscal year 1990.” That was then, but I doubt much has changed (and note that the GAO was having trouble identifying countries, in part because money for police forces flows through many difference agencies). It certainly hasn’t changed in Thailand, where the US Embassy reports a staff of ten to support police work and even includes a slide show of police training. I suspect that one reason the police of the world prefer to label themselves in English is that so many of them are being funded, trained, and equipped by the US, with the UK and Australia playing supporting roles. The English speaking peoples of the world can bask in the knowledge that their common tongue has become the international language not merely of science and commerce but also of police power. No matter whether those police are corrupt or not (want to place a bet, say, about the Royal Thai Police?). No matter whether they enforce rule of law or take the law into their own hands. No matter whether they maintain civic order or brutalize regime opponents, English gets the credit. 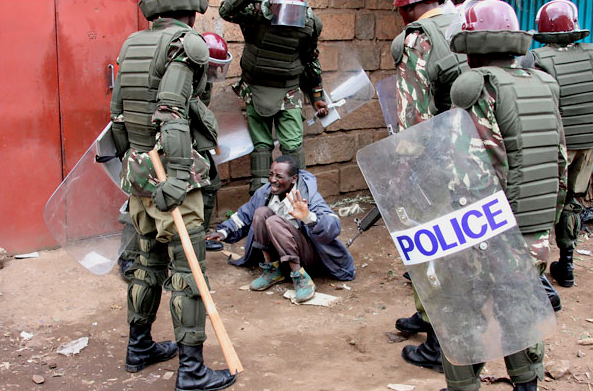 Photograph by Christophe Archambault, AFP/Getty Images and by an unidentified photographer in Nairobi, AFP/Getty Images.